Clicking “Like” is not advocacy! I dag er det FNs internasjonale dag for mennesker med funksjonsnedsettelse. Det har stilig nok et statlig direktorat markert med en konferanse som setter ord på klare utfordringer vi som samfunn har for å sikre et inkluderende samfunn. På konferansen til Bufdir fikk vi både nasjonale og internasjonale perspektiver på forhold knyttet til FN konvensjonen om rettighetene til personer med nedsatt funksjonsevne. 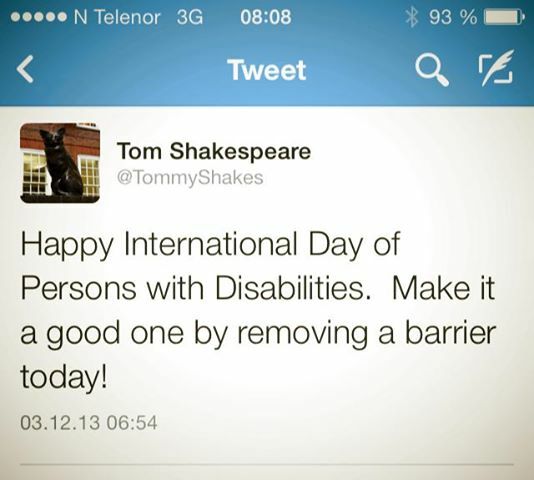 Jeg anbefaler alle som får mulighet til å både lese og høre Tom Shakespear. Han inspirerer til videre arbeid. Han er blant annet tydelig på at det holder ikke med nedbygging av samfunnskapte barrierer. Mange vil trenge ekstra støtte for å leve livene sine selv om samfunnskapte barrierer blir bygd ned. Kanskje fremsnakker han det arbeidet som mange vernepleiere gjør sammen med alle andre som jobber for personer med funksjonsnedsettelse? Eller kanskje trekker jeg han litt langt. Uansett har han noen spennende perspektiver som både utfordrer oss som samfunn og det rådende synet på funksjonshemming. 1. Speak up about what you care about, and care about what you speak up about. 2. Search out silence rather than noise. Voiceless people need your attention and support more than those who ask for it. 3. Voice is power. You have both so use them, and use them judiciously. Don’t shout or condemn unnecessarily. 4. Investigate the root causes of a problem, but don’t treat the problem as an academic exercise. 5. If you cannot offer a solution because of complexities, articulate the problem clearly. This will agitate others to help you find a solution. 6. Clicking “Like” is not advocacy. Use Facebook as a source of information and inspiration and a means to collaborate. 7. Recognise that your deeply-held principles will sometimes conflict with other people’s. Climb down from your ivory tower, and discuss grassroots situations involving real people. This will enable you to find synergies rather than differences. 8. If you find yourself speaking on behalf of someone whose opinion is different from yours, stop and re-evaluate what you are doing because you have entered dangerous territory. 10. Hamlet said that there is nothing either good or bad, but thinking makes it so. Think about whether that was a good recommendation. 11. And while we’re thinking about thinking, think deeply and critically. Use logical reasoning and deploy rational arguments from science and social science. What you think will have wider resonance, and is undoubtedly more relevant, than what you believe.